Sometimes I get stuck on thinking that everything I make has to be practical. I have always been practically minded, but as a busy working parent every minute seems to be accounted for. Making things to eat, making things to sell, making things to use are all valid. However, there are many times when making things just for fun can be incredibly freeing and enjoyable. Yesterday I made a ‘who am I’ collage. It is not anything I will use, it really was just for fun. I went through a bunch of magazines, and pulled out images that resonate with me. Then I glued them onto a sheet of paper. It’s not amazing. It was just fun. How about halloween? That is all about fun. Carving pumpkins is certainly not practical or useful in any way. 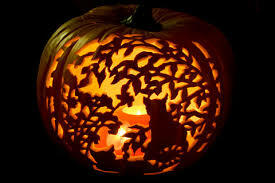 Carving pumpkins is a purely creative act. The pumpkins are e njoyed for a night or a few, and will eventually rot. They certainly are not lasting works of art. There are a whole other set of creative acts that people perform that are for more spiritual reasons. Sugar skulls are made for Mexico’s Day of the Dead celebration to remember and honor a friend or relative who has passed away. 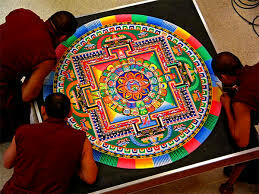 Tibetan monks create sand mandalas that take them hours and hours and then sweep them away. They do this practice for meditation, and not for a finished product. Today, is there something you can make just for fun?